Since its initial discovery as a proto-oncogene, the serine/threonine kinase Akt (also known as protein kinase B or PKB) has become a major focus of attention because of its critical regulatory role in diverse cellular processes, including cancer progression and insulin metabolism. There are three highly related isoforms of Akt (Akt1, Akt2, and Akt3) and these represent the major signaling arm of PI3K. Akt is activated by phospholipid binding and by phosphorylation within the carboxy terminus at Ser473. IHC was performed on LNCaP prostate cancer cell pellets, untreated or treated with LY294002 #9901 (a specific PI3 kinase inhibitor that inhibits Akt phosphorylation) (Figure A), as well as human breast carcinoma (Figure B). 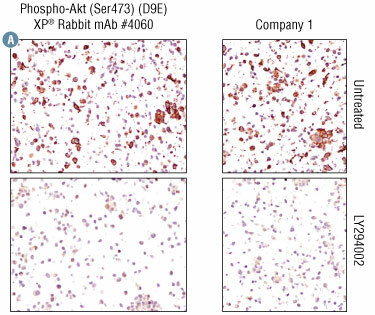 The optimal dilutions for Phospho-Akt (Ser473) (D9E) XP® Rabbit mAb #4060 and competitor phospho-Akt antibody were first determined on cell pellets (Figure A). This dilution was then used to compare the two antibodies on human breast cancer carcinoma tissue (Figure B). The target-specific staining of #4060 is significantly stronger and more distinct than that of the company 1 antibody. While antibody staining can look quite similar when examined on cell pellets, tissue staining requires a higher level of antibody sensitivity so #4060 is the superior antibody for IHC on tissue sections. Function: Akt is activated by phospholipid binding and by phosphorylation within the carboxy terminus at Ser473. 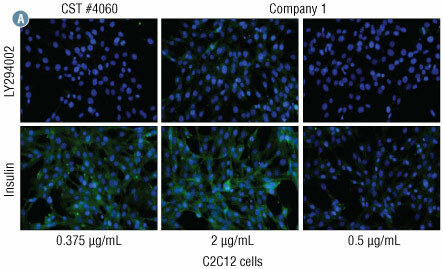 Samples: C2C12 mouse muscle progenitor cells were treated with LY294002 #9901 (a specific PI3 kinase inhibitor that inhibits Akt phosphorylation) or with insulin that induces Akt phosphorylation. CST’s #4060 (green) appropriately stains the ruffled membrane/leading edge accumulation following insulin stimulation and shows little-to-no staining in LY294002 treated cells. 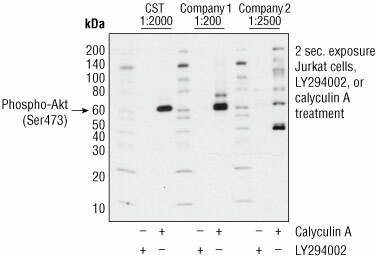 Company 1 antibody at 2 μg/ml exhibited very high cytoplasmic stain with some diffuse nuclear background in the LY294002-treated cells with signal intensity comparable to #4060 in the insulin-treated cells. At 0.5 μg/ml dilution, the competitor 1 antibody signal was lower in insulin treated cells compared to #4060. This data shows that #4060 can give stronger signal with less antibody. #4060 (green) appropriately stains the ruffled membrane/leading edge accumulation following insulin stimulation and shows little-to-no staining in LY294002 treated cells. 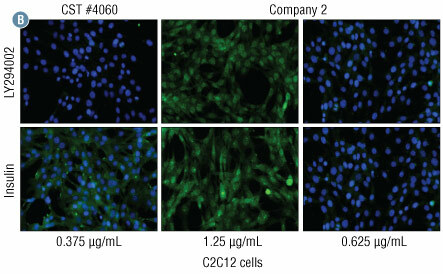 Company 2 antibody at 1.25 μg/ml, displayed prominent nuclear background in both the LY294002- and insulin-treated cells, with higher background. 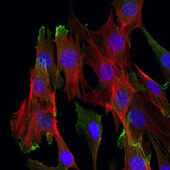 At 0.625 μg/ml antibody concentration, the signal in insulin treated cells was barely detectable. Function: Akt is activated by phospholipid binding and phosphorylation within the carboxy terminus at Ser473. Samples: Jurkat cells were treated with either Calyculin A #9902, a potent phosphatase inhibitor, to preserve existing Akt phosphorylation levels or LY294002 #9901, a specific PI3 kinase inhibitor, to inhibit Akt phosphorylation via PI3 kinase. CST’s Phospho-Akt (Ser473) (D9E) XP® Rabbit mAb #4060 recognizes a strong specific band at 60 kDa in the Calyculin A-treated Jurkat lysate. Company 1 phospho-Akt (Ser473) rabbit polyclonal antibody recognized the appropriate band, as well as a cross-reacting band at ~75 kDa. This antibody is not specific for phospho-Akt. Company 2 phospho-Akt (Ser473) rabbit polyclonal antibody displays significant background banding in addition to the appropriate band, and the band of interest is weaker than other cross-reacting bands.